McClain’s Taylor Butterbaugh (left) and Maddy Crawford (right) block an attempted spike by Fairfield’s Taylor Lawson (21) while Lady Tiger Kaleigh Easter (23) and Lady Lion Kami Magee (12) are in position to follow up on the play. 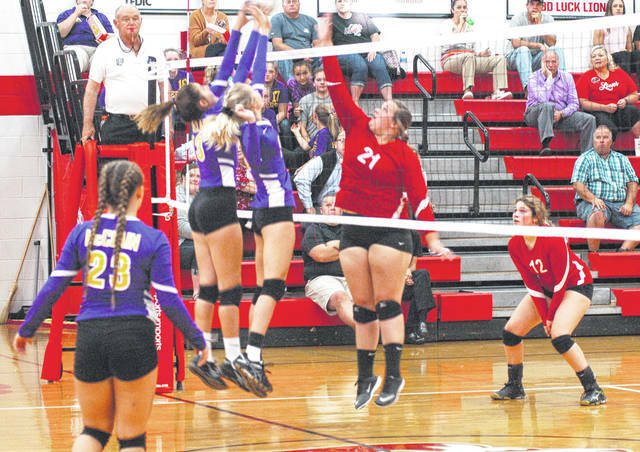 The Fairfield Lady Lions volleyball team improved their record to 9-2 on the season after they hosted the McClain Lady Tigers on Monday at Fairfield High School in Leesburg. The Lady Lions needed only three sets to beat the ladies of McClain 25-18, 25-14 and 25-20. Fairfield took control of the match early in the first set as they quickly built a 10-5 lead and forced McClain head coach Taylor Alsop to call the first timeout of the match. Following the stoppage the Lady Tigers were able to get to within three points before Fairfield got rolling again and led by five at 18-13 when Alsop signaled for her second timeout of the set. The Lady Lions kept rolling following the stoppage as they extended their lead to 10 points at 23-13. McClain was able to tally five points in the time it took the Lady Lions to finish out the set but it was to no avail. In the second set the Lady Tigers went down 4-0 before rallying to take the lead at 7-6 and force Fairfield head coach Lesley Hattan to call the first timeout of the set. Fairfield responded following the timeout as they fought back and tied the game at 12 before Ally Davis reeled off four straight service points, including one ace, to give the Lady Lions a 16-12 lead. A timeout by Alsop did little to stem the tide for the Lady Tigers as Fairfield allowed only two more points in the set. With the score at 18-13 Taylor Lawson stepped behind the line to serve and recorded six straight service points to put the Lady Lions up 24-13 and following the service break Fairfield shut the door on the Lady Tigers as they broke serve to win the set and take a 2-0 advantage in the match. The third set appeared to be all Lady Lions as they jumped out to a 9-1 lead and did not allow the Lady Tigers a service point until Macie Adams stepped behind the line and recorded five consecutive service points to get to within two points at 9-7. The Lady Tigers seemed to come alive after breaking the serve of Fairfield’s Lauren Arnold as they put together several strong volleys and immediately broke the service of Kaiti White to trail 13-9. Makenzie Montavon stepped behind the line and recorded five consecutive service points around a Fairfield timeout to give the Lady Tigers a 13-14 lead. McClain briefly took control and led by three at 19-16 before the Lady Lions responded and took a 20-19 lead. The Lady Tigers tied the set at 20 before the Lady Lions finally ended it with a service break and four consecutive service points to take the set and the match 3-0. The Lady Tigers will be back in action this evening when they travel to Hillsboro to take on the Lady Indians in a Frontier Athletic Conference showdown. Fairfield is also in action tonight as they travel to Fayetteville to take on the Lady Rockets in a match up of two of the Southern Hills Athletic Conference’s top teams.